Welcome to the Woodland Hills Counselor Connection! My 4-year-old was climbing into bed, his face turned away from me and toward the wall, when he asked the question. His tone made the question sound like an afterthought, but I know better. Glenn is the opposite of an afterthought; he’s the tiger lovey blanket my son has been carting around with him since he was old enough to maintain a tight grasp. My husband offered to head back downstairs to search, and I absently commented that I actually hadn’t seen Glenn around that evening, which was unusual. At that, my son slowly turned around to face me but without making eye contact, his mind racing. His eyes were fixed on some background point as his mouth twisted and turned with each darting thought. They met mine only as he realized it, his shoulders straightening and his back growing taller as the panic scaled him. Oh, sure, we’d lost Glenn before, but he’d always been found before bedtime, even if sometimes it required what felt like hours of searching. And then there was the time my son held him out the car window and accidentally let go, so Glenn spent a bit of time playing chicken on the yellow lines of a busy street. But still, there had never been a bedtime without Glenn. The initial shock was, of course, followed by electric currents of anger that coursed through my son’s little body. He punched the air and gritted his teeth and screamed, “I WILL NOT SLEEP WITHOUT GLENN! I WILL NOT GO TO BED UNTIL HE’S HERE! I WILL NOT GO TO BED EVER AGAIN!” More punching, more gritting, a few angry flops onto the floor. At this point my husband had returned from his futile search, and was looking at me for direction. How are we handling this one, mama? I don’t know if the look I shot back reflected confidence, wisdom, and clarity, but believe it or not, that’s what I felt. Because right when I needed it most, I remembered the train analogy. The analogy was nothing new, something I’d learned in my own therapy years before I had kids and something we’ve all heard in the form of an overused cliche. Truthfully, I’d always struggled to apply it to my own rush of emotions, but here, with my poor child flopping around on the floor like a fish out of water, it seemed like the only reasonable response. Difficult feelings are tunnels, and we are trains traveling through them. We have to move all the way through the darkness to get to the—you knew this was coming!—calm, peaceful light at the end of the tunnel. It sounds simple, but it’s way easier said than done. The problem is that we well-meaning parents and caregivers often attempt to intercept our children on their journey through an emotional tunnel. It’s only one night. We’ll get him back tomorrow. We have so many other stuffed animals, just sleep with one of them tonight. You’ll be fine, I promise. Those would all have been true statements, not doubt, but they would not have been helpful ones. So often when our kids are struggling with a difficult feeling—sadness, anger, fear, embarrassment, loneliness, guilt—we try to logic them out of it. We explain why they’re overreacting, or how WE know it will turn out just fine in the end. We’re trying to help our children, of course, but if we peel back the layers a bit, I think we’ll find that what we’re really doing is trying to make OURSELVES feel better. Because our children’s pain hurts US so deeply, makes US so acutely uncomfortable. We’re the ones who want their crying to stop as quickly as possible—not them. Back to the analogy: If emotions are tunnels and we are trains going through them, then we NEED to keep moving all the way through to the other side. What we adults often do when facing our own emotional struggles is attempt to get out of the tunnel early—banging on the sides, ignoring the cavernous echo, and wondering with confusion why we can’t see daylight yet. Sometimes we squat in the darkness, close our eyes, and just pretend we’re not in a tunnel at all. Everything is just fine, thank you very much. Sometimes we do a whole host of other things—eat ice cream, drink wine, shop online, run marathons, binge watch Netflix, play games on our phones or scroll mindlessly through Facebook—to distract ourselves from the fact that we’re in a tunnel in the first place. But none of those things gets us out of the tunnel, does it? Then, when we FINALLY let ourselves scream and wail and bang our fists and crumble onto the floor and have a good cry, we suddenly feel so. much. better. Same goes for our kids. We can’t teach them there’s some secret side exit when there’s really not. There is no way out except through, and it’s our job to guide them there. That’s why I didn’t say a word to my son. Instead, I just sat next to him as the ripples of anger melted into shaking and sobbing. When I thought it was OK to do so, I started rubbing his back—still without speaking. He kept crying and crying and crying. With that in mind, I was actually delighted that my son was shaking with sobs because I knew that meant he was traveling through this emotional tunnel rather than getting stuck in it. He cried and he cried and he cried. Until he wasn’t crying anymore. Until, from his vantage point splayed out on the floor, he caught a glimpse of a nearby book about world-recording-holding dogs, pulled it over, and started paging through it. As if nothing had happened at all. I peeked at the clock. It had been eight minutes. I decided speaking would be OK now, so I asked my son if he wanted to make a plan. I told him I knew that bedtime tonight would be extra tough, but maybe we could think of some ideas together to help him through it. Without any additional prompting from me, my 4-year-old chose two different stuffed animals to sleep with that night, then asked if we could read two extra books before bed to help make the evening more special. Yes, dear son, you are. Because this is where resilience is built. Had I driven an hour each way to retrieve Glenn, we wouldn’t have built resilience. Had I told him over and over again it was no big deal, it’s just one night without one stuffed animal, we wouldn’t have built resilience either. The message there would have been that his pain was invalid and that his struggles weren’t worth being taken seriously. But simply sitting by his side as bumped his way through the tunnel? Allowing him to feel the rush and the panic, and then come up for air all on his own? THAT is building resilience. So the next time your child is deeply frustrated, angry, or upset, remember what the job of a parent really is. Provide comfort through the frustration. Draw out our child’s cleansing tears. Show empathy to our child’s struggle. Allow the life lesson to be learned naturally—not through preaching. Support our child’s journey through the emotional tunnel. The job of a parent is NOT to get our child to stop crying as quickly as possible. Tears are a sign of parental success, not failure. So rub your child’s back. Sit with them in silence. Stay alongside them as they chug chug chug through their tunnels of feelings. And be with them when they finally reach the calm, peaceful light at the end. We have all had those days when our kids come home and they seem a little more on edge, quick to cry or get mad. You may feel as though you unintentionally just stepped on an roller coaster and boy are you in for the ride of your life. As you navigate this ride, you discover that you have just joined them on the roller coaster of emotions that they have been holding in all day until they encountered you, the one they love more than anything, who will jump in with them. Give your child time to communicate. A lot of times this happens during cuddle time right before bed. Honor this time with your child. Some times it may feel like a procrastination technique, however, they may be trying to free their precious brains of the things that happened during the day. Some times those things that they are trying to process are the comments that may have been or they may be interpreting as hurtful. Resist the urge to bombard them with questions, it is okay to sit in silence and wait. Don’t judge. As a parent, a very natural reaction when someone makes a hurtful comment about your child is to say, “well, that kid is mean.” Please refrain from putting down the other child in front of your child. This only teaches that calling names is okay and may build a barrier to your child ever becoming friendly with the child who has hurt them. Talk about what happened before. In some situations a child may unknowingly or on purpose do something to classmate that leads to them making a hurtful comment. The mean comment is still unwarranted and unacceptable, but sometimes knowing what happened before is helpful in diffusing the situation. If you find your child did do something, such as not include the child in a game, it is easy to help them correct the behavior in the future so the other child responds in a more positive manner. Brainstorm responses. Next, come up with responses that your child could say when someone says “I don’t like you.” Talk through using a confident tone and body language when addressing the child that has made a hurtful comment. Finish by making a plan on what to say as well as what to do next after they address the other child. Role play. You want your child to be as prepared as possible in the situation. The best way to do that is to practice and rehearse what they will say. Take turns being the child who makes the mean comment and the child who stands up for herself. If you are interested in some books on this topic be sure to check out: Tease Monster, Bye, Bye Bully and Stop Picking on Me. DURING GUIDANCE, WE HAVE BEGUN TALKING ABOUT BULLYING BEHAVIOR AND THAT RESEARCH STATES THAT THE MOST POWERFUL FORCE IN STOPPING BULLING BEHAVIOR IS FOUND IN OUR BYSTANDERS. STUDENTS LEARN THAT BULLYING BEHAVIOR IS WHEN THE NEGATIVE BEHAVIOR IS REPEATEDLY BEING DONE ON PURPOSE AND THERE IS A POWER IMBALANCE. HERE ARE A FEW POWERFUL TIPS FOR THE TARGET ADAPTED FROM SARAH TITUS’ BLOG. 1) REMEMBER THAT THE PROBLEM IS NOT YOU, IT’S THEM!! There are some people out there who thrive on making others miserable. The more they make others feel bad about themselves, the more power and control it gives them, in turn making the bully feel better about themselves. Tell people of higher rank that this is occurring. In doing so, sometimes you will find that they are the ones who are either in on the bullying as well, or they are friends with the bully. Keep going up in rank as high as you can until someone listens. Having your friends around you and joining groups can be of great help. If there is a bully who is picking on you, and you are with the entire wrestling team, they’re not going to bother you. Even if it’s the chess club, it doesn’t matter. Strength comes in numbers. The bully will want to isolate you. This gives them control. Make lots of friends and don’t let them win. The more successful you are at something, the more people hate to see your success and want to take you down. It makes them feel bad that they are not as awesome as you are, and they don’t like that feeling, thus, they try to chop you down to their level. Another hard one for sure. Keep in mind that a bully usually has some things going on themselves that are so painful that it is their only way of reacting to the situation that they know how. Many bully’s are secretly abused themselves, and feeling helpless, they try to control everyone and everything else. Maybe they have lost a parent or loved one. Whatever tragedy they are dealing with, when you show them love they may soften. I am currently taking an online class about School Mental Health. This course has been an incredible examination of my personal and professional practice. 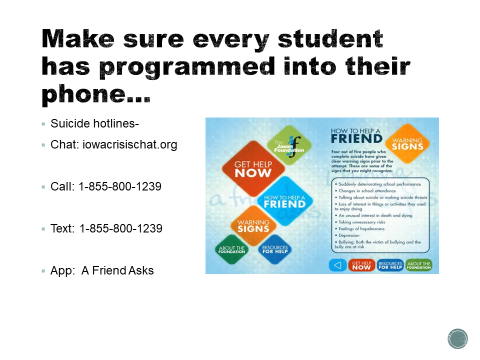 At the elementary school level, we have not talked about suicide in a public way. However, some students and families have felt the impact of suicide and worked through the questions that we encounter from our young children. Encourage your children to open up and talk. And as you feel appropriate, please utilize this resource from the Jason Foundation. PILLOW TALK: Some thoughtful questions to ask before bed to create sweet dreams. What is your best memory this school year? Who is the kindest person you know? Why? What is one thing you would like to learn to do well? If you were an animal what one would you be and why? When is the last time someome hurt your feelings? How did you react? Do you know someone who is going though a hard time? How can you help them? What is the scariest thing that happened this year? If you could keep only one thing, out of everything you have, what would it be? Who do you think is really successful? Why? What’s the best thing about your teacher this year? When do you feel misunderstood by grown-ups? © 2011 iMOM. All Rights Reserved. Family First, All Pro Dad, iMOM, and Family Minute with Mark Merrill are registered trademarks.